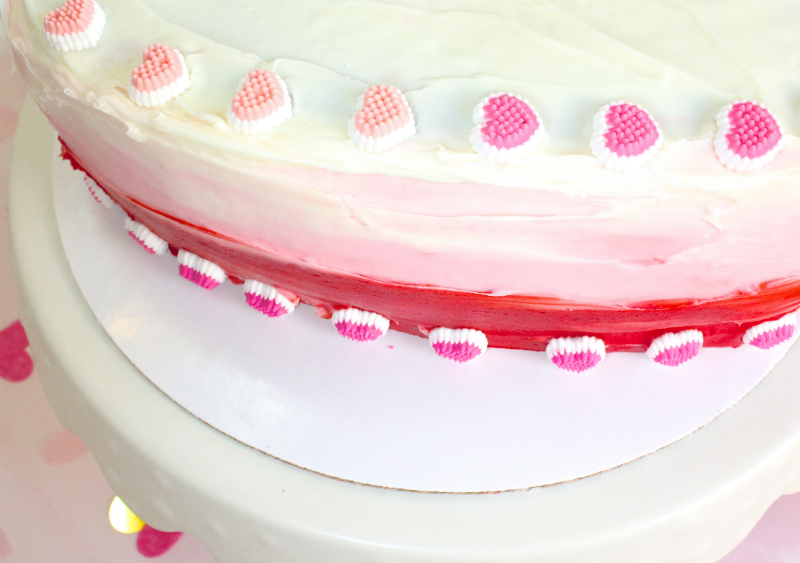 Yummy Valentine's Day Ombré Heart Piñata Cake! 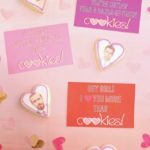 Are you looking for a fabulous dessert to complete those romantic Valentine’s Day dinners at home you have planned? 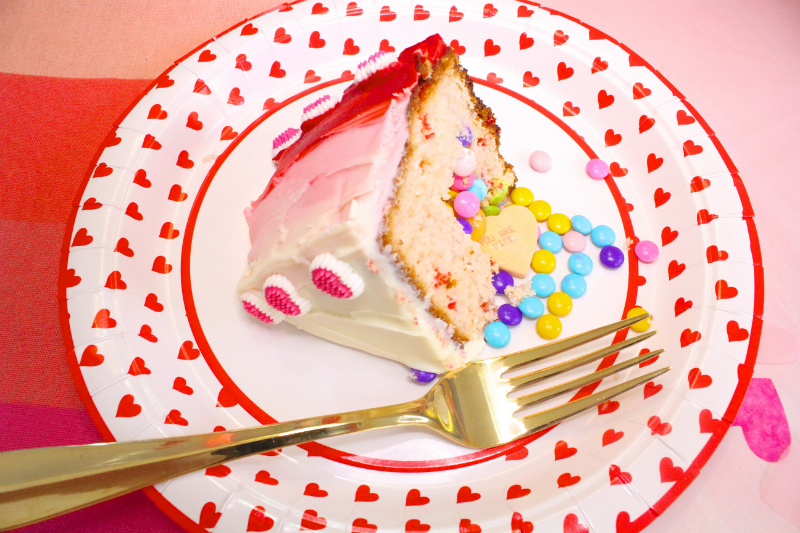 Well check out our Yummy Valentine’s Day Ombré Heart Piñata Cake! 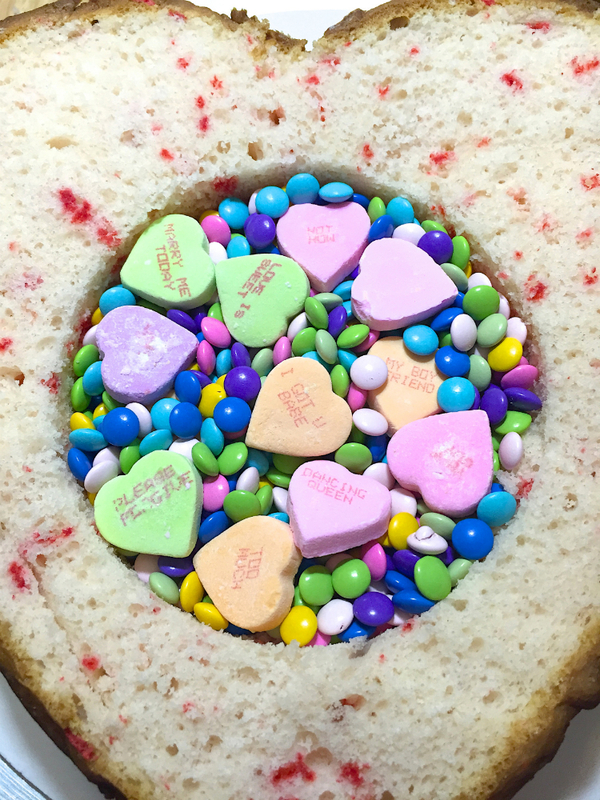 It’s tasty on the outside and sweet on the inside with it’s candy filled center. 2 boxes of cake mix. 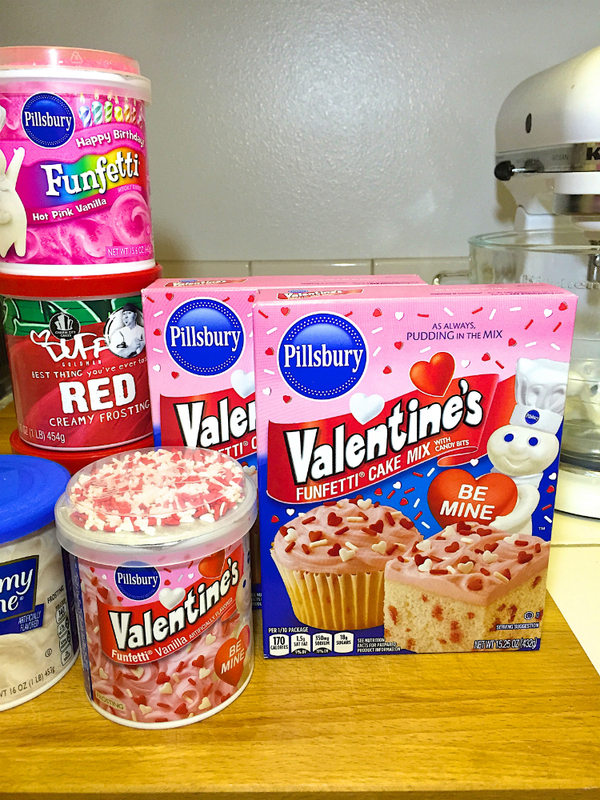 I used the Valentine’s Day Funfetti Cake Mix but you could use any store bought cake mix. 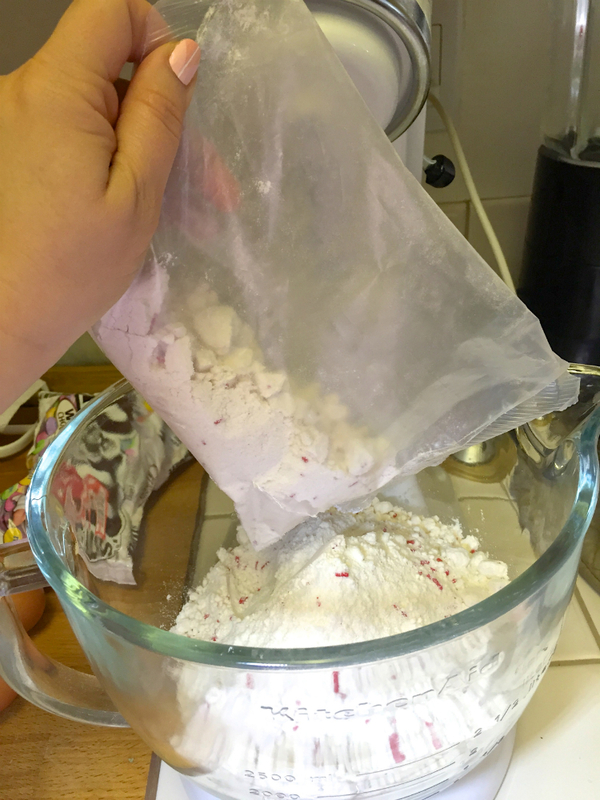 3 containers of store bought Red, Pink, and White Frosting. 5-6 inch round cookie cutter. Assorted Valentine’s Day themed or colorful candies. I used conversation hearts and milkies candies from Sugarfina. 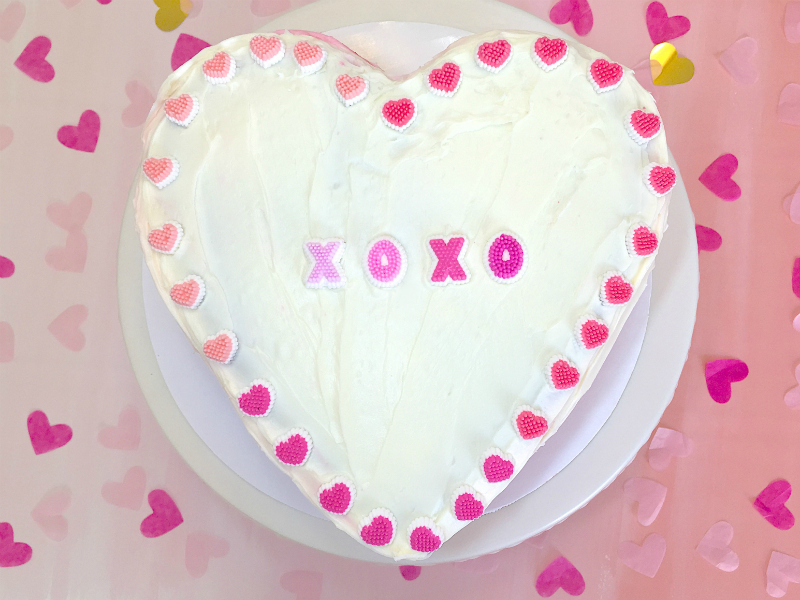 Sugar Hearts and XOXO’s that I got at Target for added decoration. You can make the cake with out it. And all ingredieants found on your particular cake mix. I first made my cake mix following the directions on the box. 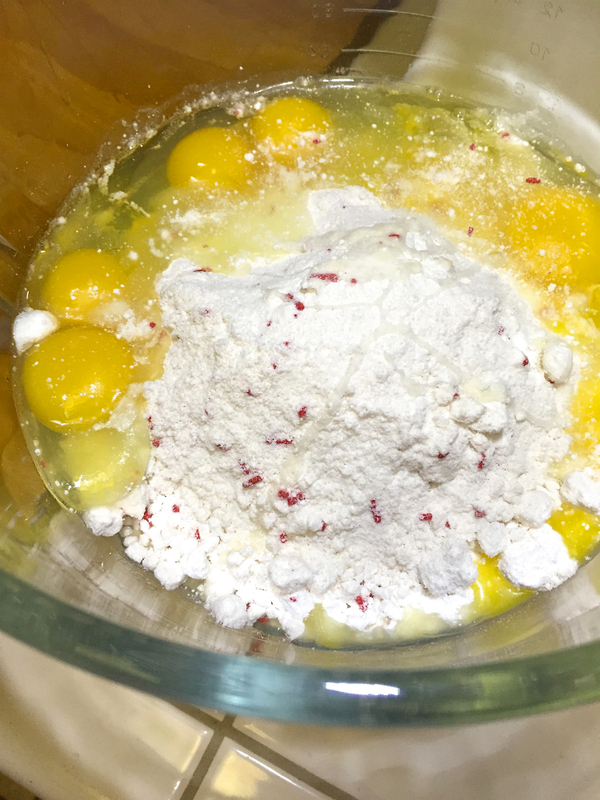 I poured the mix, eggs, and oil into my mixer. I mixed until completely smooth and mixed together. 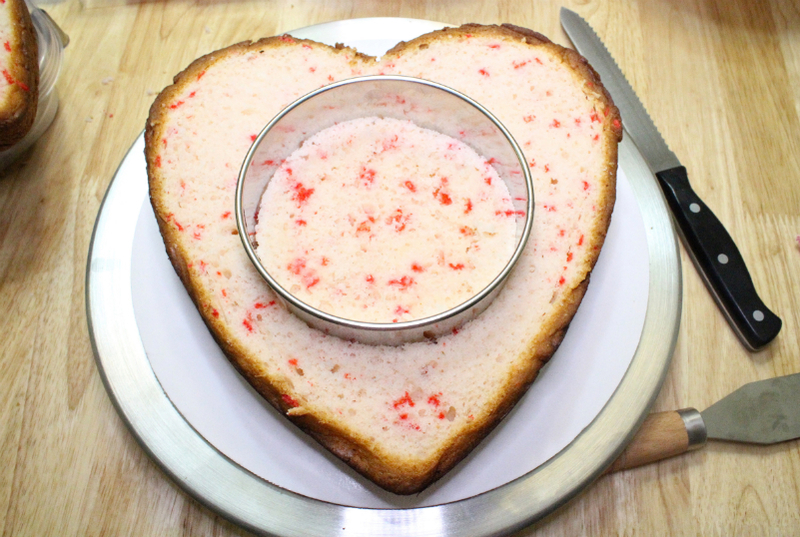 I greased my pan with the cookie spray so the cake won’t stick to the pan and poured my mix into my heart shaped pan. I always spray my pans even if it says non-stick. I don’t want to risk it. I baked it according to the box directions for a single round cake. 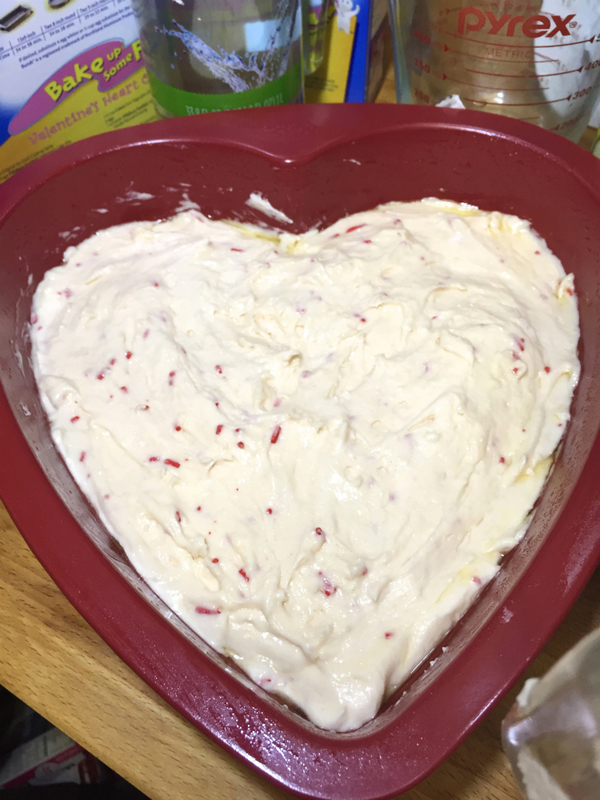 I made two heart cakes. Once the cakes were done I let them cool on a cooling rack out of the pan for about 20 minutes. I then cut off the top layer of the cake to make it a flat surface. I then took my large round cookie cutter and pressed it down half way through the cake. 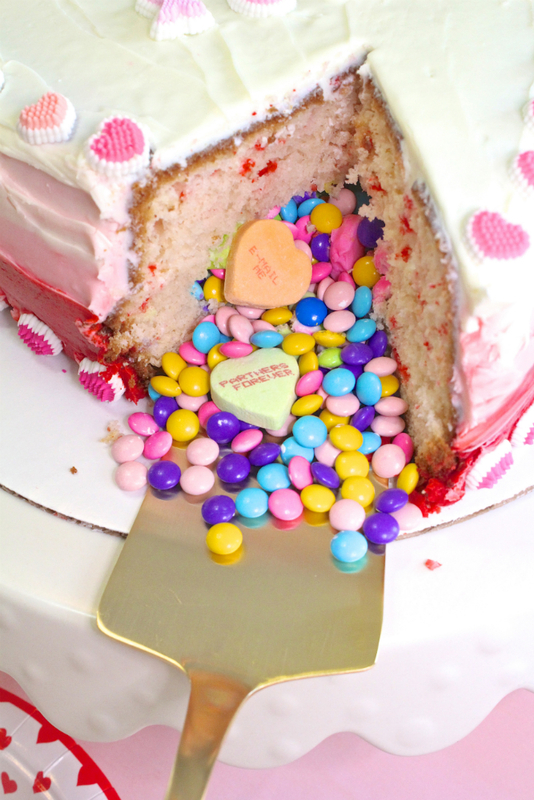 You DO NOT want to press it all the way through or your candy inside will fall out of the bottom of your cake. You pull out your cookie cutter and scoop out some of the cake. 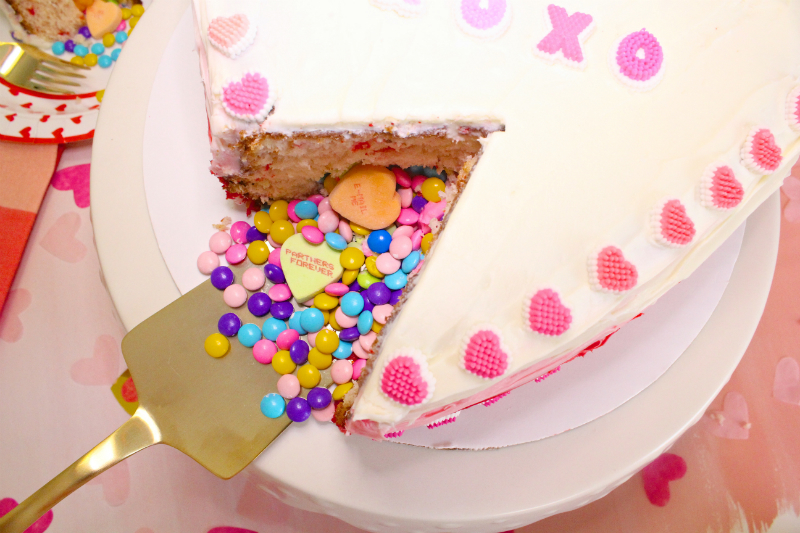 You then fill the hole in the cake with your candy. You place the other layer of cake you baked on top of this layer of cake. 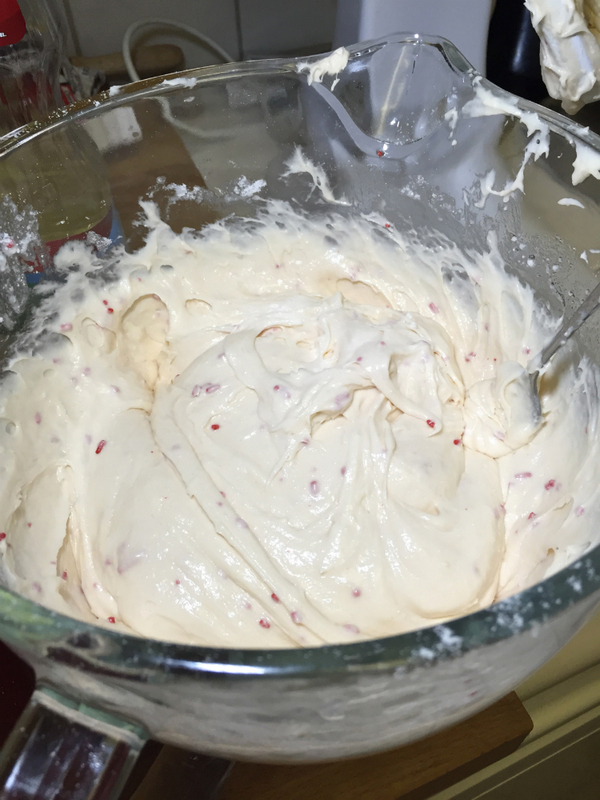 You then ice the top with white frosting first, then pink, then red making sure to clean your spatula with each layer of frosting. You do one layer of frosting then place the cake in the fridge for 15 minutes so it hardens up so the second layer will go on smoother. You then repeat the process for the final layer of frosting. 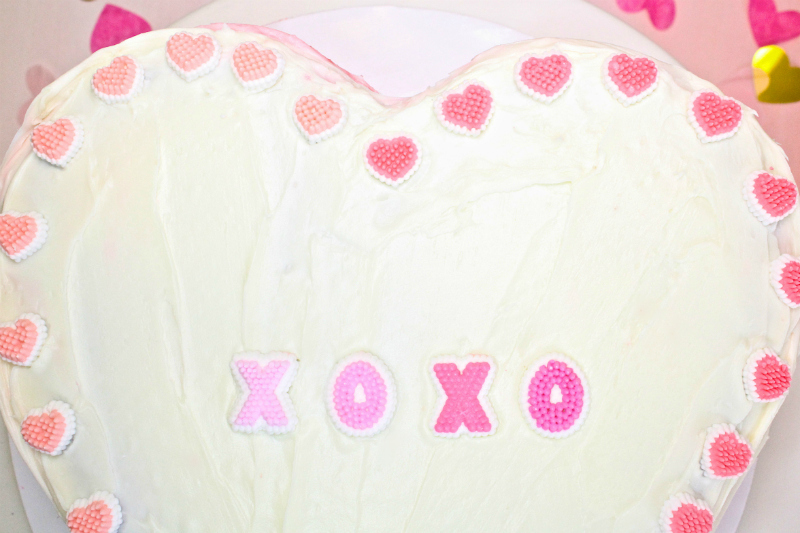 You then decorate with your sugar decorations hearts and xoxo if you have them. 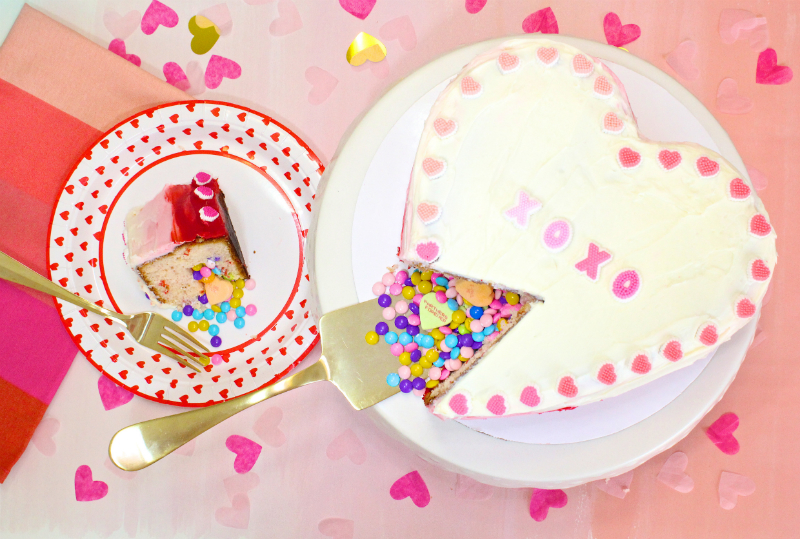 You then carefully cut yourself a slice of this beautiful yummy Valentine’s Day Ombré Heart Piñata Cake and enjoy! Be sure to cut it slowly so you make sure you get ready for all the candy that will pour out when you cut a slice. It’s such a fun surprise when the candy pours out. It’s like someone broke open a piñata the way the candy pours out! I’m seriously in love with this cake! It’s the perfect tasty treat to complete any Valentine’s Day meal or any date night meal. 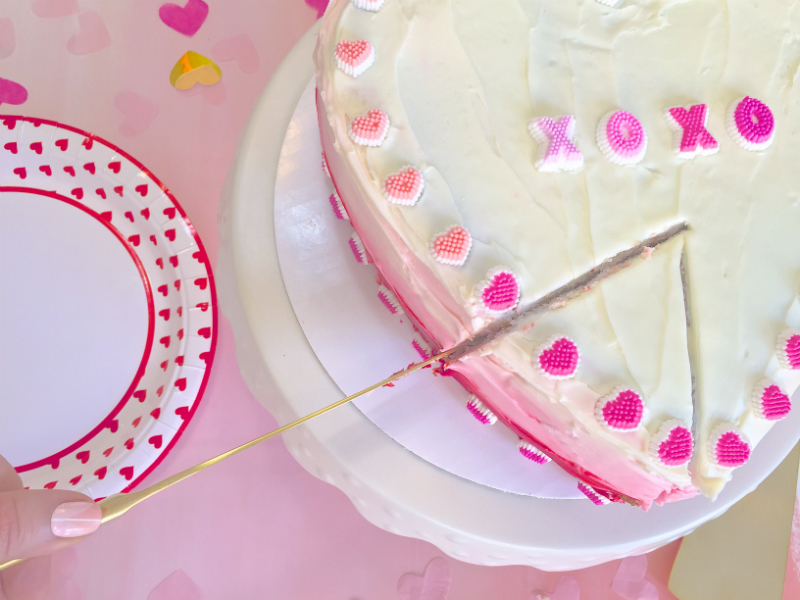 I hope you enjoy this fun Pink Ombré Heart Piñata Cake for Valentine’s Day! 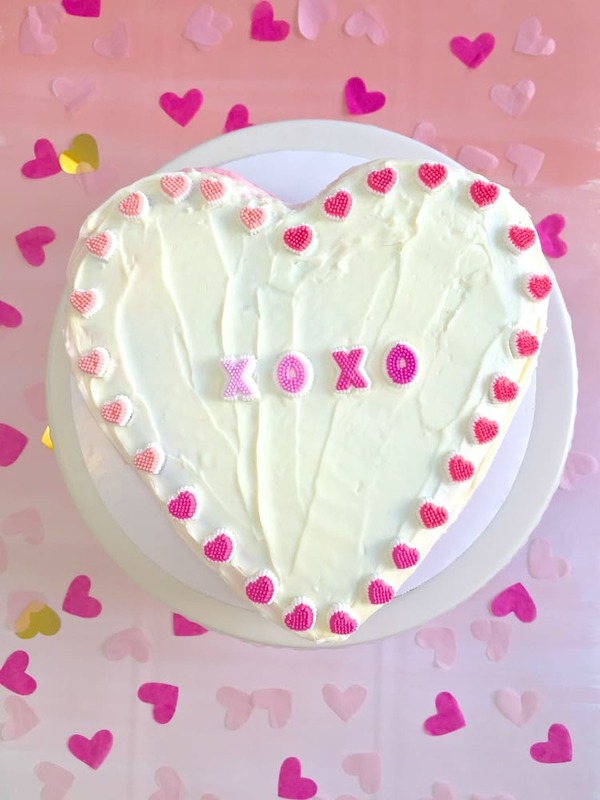 For more fun Valentine’s Day DIY’s, Recipes, and Crafts check out all my Valentine’s Day features HERE. I hope you enjoy this tasty cake as much as we do! What a cute idea! My son would think it’s amazing if he cut into his cake to find this! That’s swell. I would totally like a piece of that kind of cake! Cute, cute, cute! My kids would go crazy over this. We went to a party at my friend’s house during the Christmas holidays, and she had a pinata in the shape of a dreidle because she is Mexican and she is converting to Judaism. That was the most unique pinata I had seen, until now, lol! This is so cute & creative! Such a cute idea! I love baking cakes and haven’t had a chance to try one of these pinata cakes, yet! 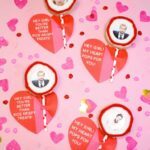 So fun with the candy message hearts inside. What a surprise to the person cutting the cake (if they don’t already know about it). That sure is a sweet treat! My mouth is hanging open….that is adorable! I so want to try this, maybe for Easter. How cute is this!!! Adorable! It screams I love you! Great idea! I’m loving these, we bought a box but didn’t make ours. We can do this tomorrow.